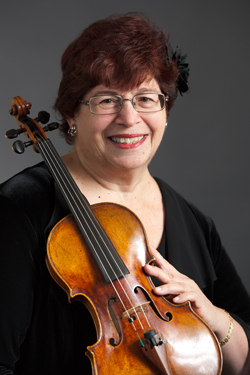 Violinist DEBRA BIDERMAN has been performing with the New Jersey Symphony Orchestra since 1967. A silver medalist in the American String Teachers’ Association Violin Competition and winner in numerous other competitions, she studied with Arianne Bronne, Richard Burgin, Raphael Bronstein and others. She was accepted to the Congress of Strings, where she appeared with Eugene Ormandy at the Saratoga Performing Arts Center. 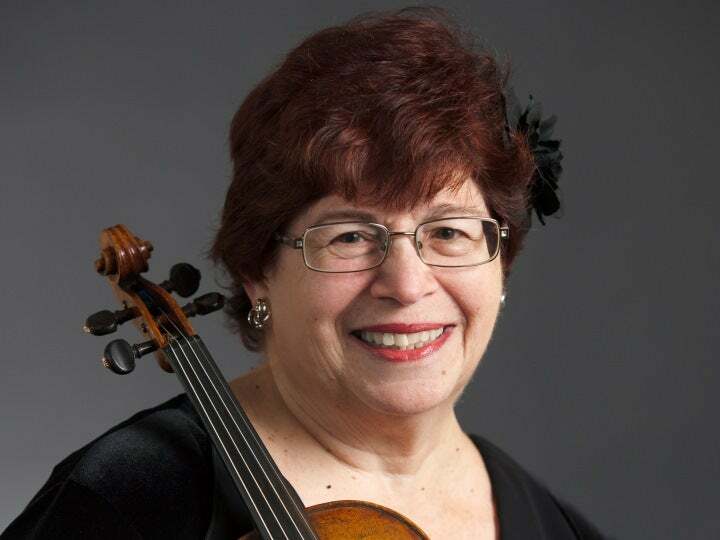 Throughout her career, Biderman has performed at Lincoln Center, Carnegie Hall, the Kennedy Center and the Adare Festival in Ireland; she has participated in numerous recordings and broadcasts. Biderman is the first violinist of the Woodland Quartet and is a frequent soloist and recitalist. Biderman is a true product of instrumental music programs in New Jersey public schools. She began her violin studies in Hackensack in first grade during a pilot program directed by George Barnoff. She continued performing through high school and played in the New Jersey All-State Orchestra for four years. A former public-school teacher in the New Jersey communities of Cedar Grove, Bloomfield, Tenafly, Newark, Pompton Plains and Edison Township, Biderman continues to teach privately. Biderman has been a resident of Central New Jersey since 1979. She is a member of the NJSO’s outreach and development committees, a member of the Edison Arts Society, vice president and fundraising chairman for NCJW National Council of Jewish Women and on the Steering Committee and facilitator for M.A.S.H. (Mutual Aid Self-Help) support groups under the auspices of St. Clare’s Health System. MUSICAL INFLUENCE: WQXR—that radio station was my access to classical music growing up. My parents didn’t listen, but I would put it on. FAVORITE TV SHOW: I don’t watch TV, because life is more interesting. I have multiple TVs, but for a number of years, I didn’t have any of them plugged in! I’ll go to live theater; I prefer that to movies. THEATER FAVORITES: It depends—I really like local theater. The George Street Playhouse, Circle Players in Piscataway, theaters in Metuchen … I used to go to Broadway a lot, both for musicals and plays. I don’t have a favorite. Kean University has great productions—I saw one about Darfur recently, called Lost Boy at Whole Foods. It was amazing. RECOMMENDED READING: I’m reading “The Passion of Tasha Darsky” right now. It’s a book about a violinist, and I’m really enjoying it—it’s a lot of fun. FIRST CONCERT YOU EVER ATTENDED: The first musician I ever saw was at the Brooklyn Museum—I saw a solo violinist there. I had just started violin, so I must have been about 5 or 6. I have this vivid memory of a man onstage playing, and afterwards I remember saying, “Why did it have to stop?” In my mind, I can recall it so clearly. I think my first full concert was one I was playing in! SOMETHING PEOPLE DON’T KNOW ABOUT YOU: My daughter just came back from Abu Dhabi with the Big Apple Circus; she has been with a circus group called the Flying Poemas. My other daughter is a nurse at St. Peter’s Hospital in New Brunswick. SPIRIT OF GIVING: Philanthropy has been a part of my family’s philosophy for generations. I believe that people should share of themselves, not just of their money, but also of their talents. In our society, I don’t know that people always think to share, but I think we should as much as we can. One thing I do to give is to perform carols at Christmastime. It’s not my religion, but I love the season, and people really enjoy hearing and participating in carols. I’ll perform in nursing homes, hospitals and many other places. CRAZY THING YOU’VE ALWAYS WANTED TO TRY: I wanted to rebuild my house as a medieval castle—and I did it! At first, I just wanted more closet space! But it evolved from there. ADVICE FOR YOUNG MUSICIANS: Focus when you practice. Practice doesn’t make perfect … perfect practice makes perfect. WHY MUSIC MATTERS: It brings me to a place other than the mundane, brings me to a higher level. Both to listen and to play it.